It's not often that we see a new benchmarking utility stroll into town, daring us to bust out some hardware and crunch a lot of numbers. This week, Basemark's Basemark GPU benchmark has landed on our doorsteps, a multi-platform, multi-API tool that can give us yet another way to look at our hardware. One of the main draws of Basemark GPU is its support for multiple graphical APIs, shipping with support for OpenGL, OpenGL ES and Vulkan while promising support for both DirectX 12 and Metal in the coming months. This utility will allow us to see how much of an impact modern APIs can have on our hardware, though today our testing will be limited to OpenGL and Vulkan on our Windows 10 test system. Basemark GPU is designed with Windows, Android and Linux support in mind, with MacOS/iOS support planned for a later version. As a PC-centric website, we will be using a Windows 10-based test system, the most popular OS amongst gamers today. A lot of our testing will be a showdown between the Vulkan and OpenGL APIs at specific graphical settings and resolutions within the benchmark, giving us a clear indication how much the newer Vulkan API can bring to the table. We will also be comparing gaming hardware from both AMD and Nvidia on each graphical API, allowing us to see which GPU brand this benchmarking tool favours. No benchmark test would be complete without a selection of GPUs, which in this case covers Nvidia's GTX 10-series and AMD's RX Vega and RX 500 series graphics cards. We have replaced our RX 480 GPU with its RX 580 equivalent, giving us a fairer comparison point between AMD/Nvidia's modern graphics card lineups. This is where things start to get a little tricky. 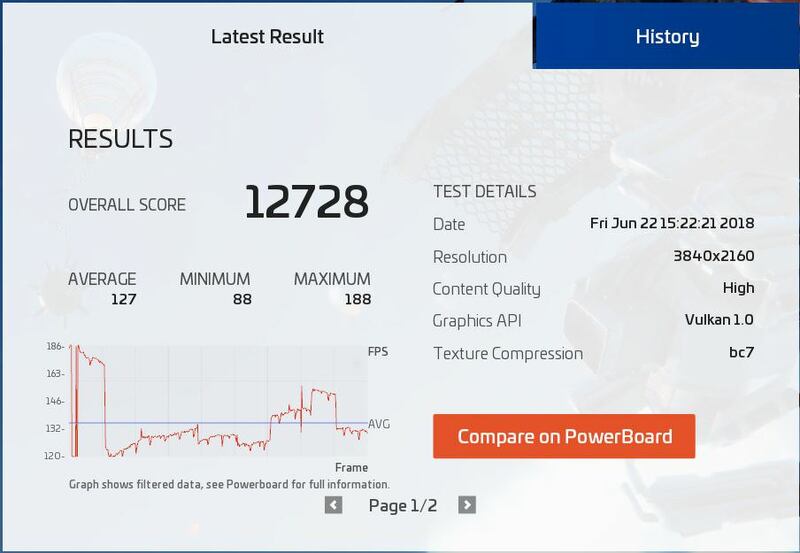 While using Nvidia GPUs we found that the benchmark ran flawlessly when utilising the company's latest Geforce 398.11 WHQL drivers, things were not as rosy on the Radeon side. While running the benchmark, all of our AMD graphics hardware was unable to produce usable results. The Basemark GPU crashed shortly after running the tool. Thankfully the benchmark started operating correctly when we used AMD's 18.5.1 driver, though all newer driver iterations caused the application to crash. It would be easy to say that AMD drivers are at fault here, though it is worth noting that Basemark didn't claim that they worked with AMD/Radeon during Basemark GPU's development, which could have caused some of these issues. Below is a quote from Basemark's official Basemark GPU Press Release. "Basemark GPU is developed in close cooperation with key player semiconductor companies, such as Imagination Technologies, Intel, NVIDIA, Qualcomm and Renesas within Basemark’s benchmark development program. This close cooperation with the leading GPU and CPU companies of the world ensures that the benchmark will be extremely reliable and also represent the utmost in objectivity. "